A picture of a painted fire hydrant along the highway in the town of New Carlisle in Quebec, Canada. The community of New Carlisle in the Gaspesie Peninsula in Quebec, Canada are extremely laid back and love to adorn fire hydrants to decorate their town. Tourists that pass by this artistic fire hydrant always stop to take a picture to show their hometowns how unique the people of New Carlisle are. Decorated Fire Hydrant along highway 132 in the town of New Carlisle, Gaspesie, Gaspesie Peninsula, Bay of Chaleur, Quebec, Canada. 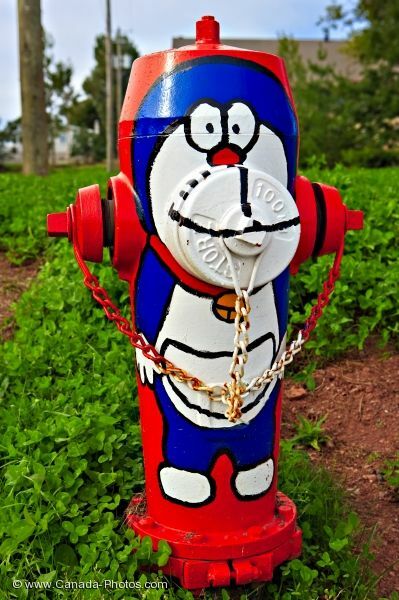 Picture of a fire hydrant creatively decorated in town of New Carlisle in Quebec, Canada.